Alright, alright, alright! 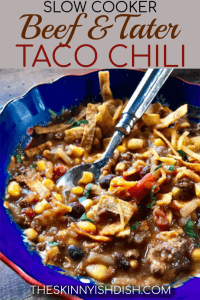 The Slow Cooker Beef and Tater Taco Chili creation that I’ve got for ya today is not bad. In fact, we think it’s really, really darn good. 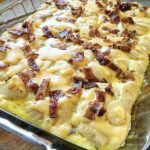 It might even be a recipe that Barney would have probably described as “Legen… wait for it…… dary!” I hope you got that reference. But if you didn’t it’s okay, we can probably still be friends. Extra credit for everyone who knows what it is, okay? So let’s talk. Y’all know about my Cowboy’s Meal, right? Well if you don’t, please make that too – it’s a family favorite. 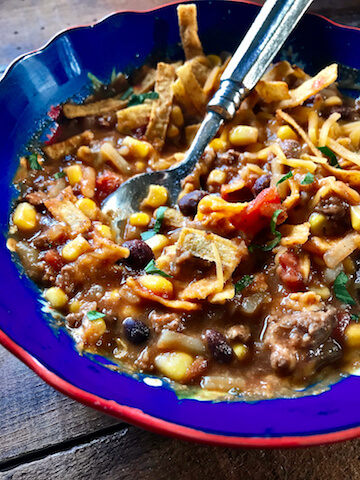 In a nutshell, this Slow Cooker Beef and Tater Taco Chili is Cowboy’s Meal on crack and in chili form. And We love it. And, We’ve eaten it every single day for two weeks now, and I’m making it again tomorrow. Because since the weather has turned chilly, we’re not sure if we can live without it! Am I being a little extreme? Yeah, maybe. Either way, you’re gonna love this one, folks. 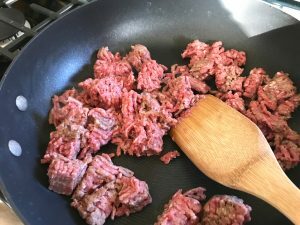 The best part about this recipe is that it takes just a few minutes of prep, which includes browning up the ground beef and using the can opener. Pretty easy, right? Anyone can make this, and everyone can enjoy it! 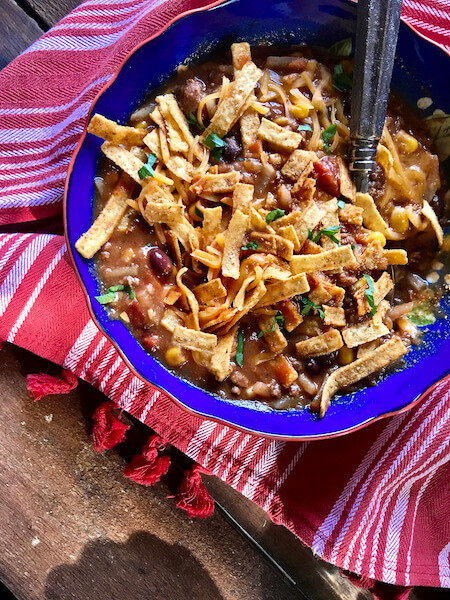 Like I said, we’ve been eating this on and off for a couple weeks now because it’s so easy to prepare, and it’s just so darn good! 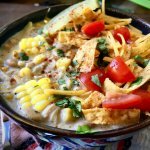 Last month was a little too crazy for comfort – I found myself grabbing the slow cooker and throwing stuff in it on the daily. So honestly, this recipe was created because I was feelin’ tired and lazy, and we just needed to not eat Taco Bell. Story time. Eric is a Chili Elitist. He has serious issues when I call something chili and it’s not a classic chili… so when I told him the name of this soup, he got pretty defensive. 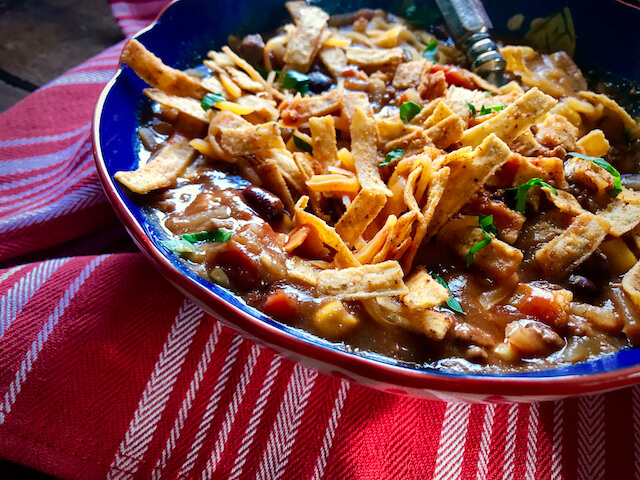 We ended up in a pretty serious debate about what chili should be. Long story short- he ended up on the couch that night. HA! Just kidding… not. Yes I am. For real though, what do you guys think? 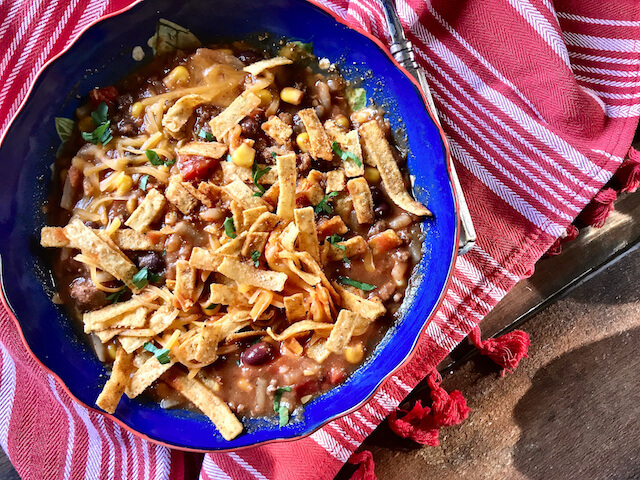 For a recipe to officially be called chili, must it be limited to a set of basic ingredients such as beans, tomatoes, and beef… or can we just live in the now, and cook what we want how we want? I guess that’s a debate for another day. 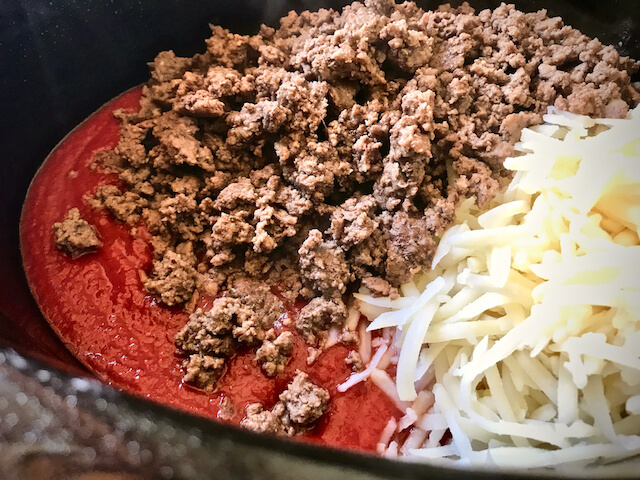 Start off by browning a pound of ground beef in a skillet over medium heat. Add a pinch or two of kosher salt, and some freshly cracked pepper. Drain off any grease after it’s finished up cooking. Now just throw a bunch of stuff into your Slow Cooker. 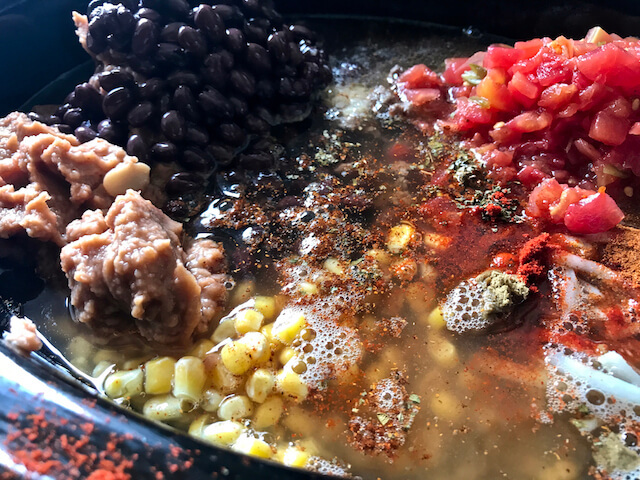 It really doesn’t matter in which order you do this, but I start off with the can of tomater sauce, the ground beef, three cups of refrigerated or frozen hash browns, a can’a black beans, a can’a refried beans, a can’a rotel, and two cups frozen corn. Then add the best part- the spices. That’s really what chili is all about, right? You’ll add 1.5 teaspoons of onion powder, 1 teaspoon garlic powder, 2 teaspoons chili powder, 1/2 teaspoon oregano, 2.5 teaspoons of cumin, 1 teaspoon oregano, 1/2 teaspoon smoked paprika, and 1.5 teaspoons of Lawry’s Seasoned Salt. Then you’re gonna add 4 cups of beef broth, preferably low sodium. Stir it all up really good, pop the cover on, and let it sit for about 8 hours on low, or 4-5 hours on high. Then just Salt & Pepper it to taste before serving! In true soup and/or chili fashion, I love toppings. I need texture, and I pretty much always need cheese. 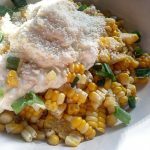 I kept these toppings pretty simple – I just grabbed some tortilla strips you can find these in the grocery store near the croutons), a few pinches of cheese, and just a smidge of cilantro. And there you have it friends – it’s delicious, healthy, easy, and perfect. 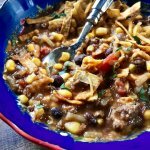 A delicious and easy slow cooker chili full of black beans, refried beans, tomatoes, corn, ground beef, and potatoes with a Tex-Mex taste. In a skillet over medium heat, sprinkle salt and pepper on ground beef and cook until no longer pink. 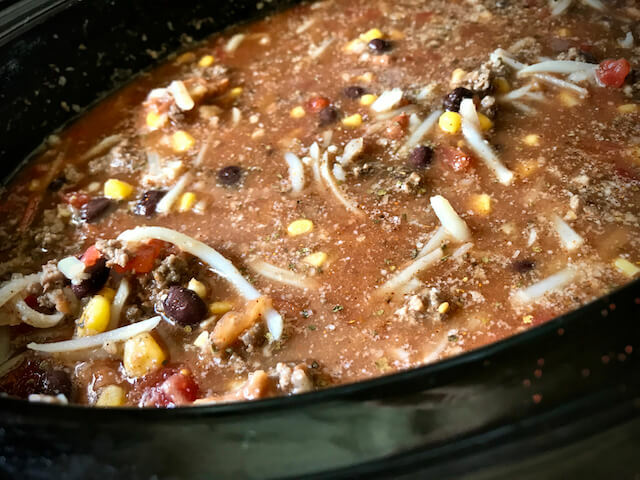 Place ground beef and all of the ingredients above into slow cooker. Stir together until combined well and cook on low for about 8 hours or on high for 4-5 hours. Salt & Pepper to taste. 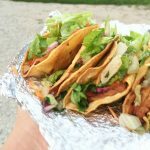 Top with cheese, tortilla strips, fresh cilantro, jalapeños, or whatever sounds good! Enjoy. I made this yesterday and it was so quick and easy. I cooked on high for 4 hours and it was perfect! You’ve done it again! Another 5 star recipe. Also we will have leftovers for days so this is totally budget friendly! Could I use frozen diced hashbrowns inn place of the shredded? Hi Star! I’m looking forward to making this recipe over the weekend. I was just wondering, have you tried making it in the Instant Pot yet? And, if so, how long did you cook it for? Thank you so much! Hey Megan! 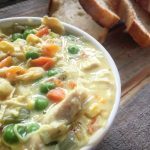 I’m so sorry while I am working on converting a lot of my recipes for the instant pot I have not yet gotten to this one! If you want my best guess (keep in mind I am still getting the feel for the instant pot) I’d have to say use the sauté mode for the beef, add all ingredients, and then pressure cook for ten minutes, let it naturally release for 15 minutes and then quick release the rest. Let me know if you give this a try, please! Hope you enjoy. 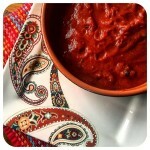 This chili is AMAZING! Can’t wait to eat the leftovers for lunch this week at work. I made the chili tonight and it was amazing. Kid and husband approved. Thank you for creating all your wonderful recipes for us to enjoy. I’m so happy you enjoyed, Leslie!! 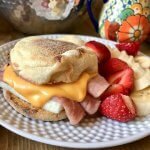 thank you so much for letting me know and stopping by to comment and rate the recipe. I appreciate it! Hi Kristin, I just double checked my notes because I do make mistakes from time to time, but it’s all correct on my end. Check if you input raw ground beef because it will make a difference in the recipe builder. Points make a difference in the recipe builder with things like meat (raw/cooked) potatoes (raw/cooked) and pasta (dry/cooked) I’m sure there’s a few other things as well, but off the top of my head it can make a difference in points if not entered properly. Does anyone know if I drain the black beans? In the pic they look drained so that’s what I’m going do. Can’t wait yum! Hi Kelly, I actually didn’t drain the black beans, but you sure can! I don’t think it’ll make too much of a difference. I hope you love it! let me know how it goes! OMG this was EASY and so amazing! Prepped it the night before and the morning before running out the door dropped it in and boom done! 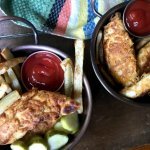 Husband and I both just loved it and had plenty for leftovers! Hi Kristen! I am so happy you and your husband enjoyed! Hi Kim, you can totally add an extra can of beans of whatever kind doesn’t bother your stomach. 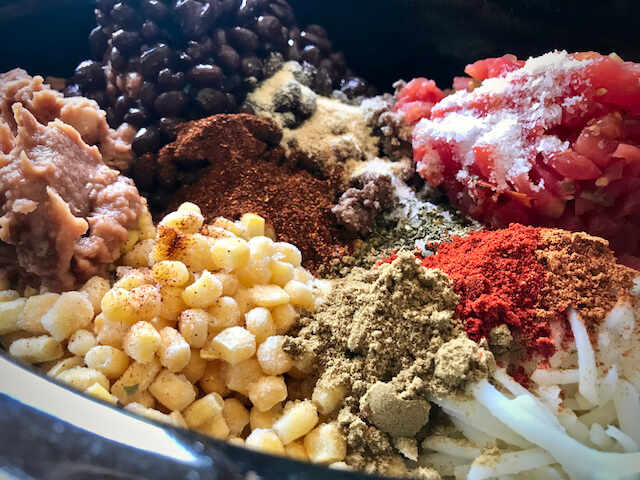 I use the refried beans as a thickener as well so if you can try to mash up one of the cans of beans you use just a bit with a potato masher. I hope that makes sense and I hope you enjoy! Will this freeze and reheat well? Trying to make some healthy, filling meals for my sis who just had a baby. Thanks! Yes it’ll freeze just fine. Happy cooking! 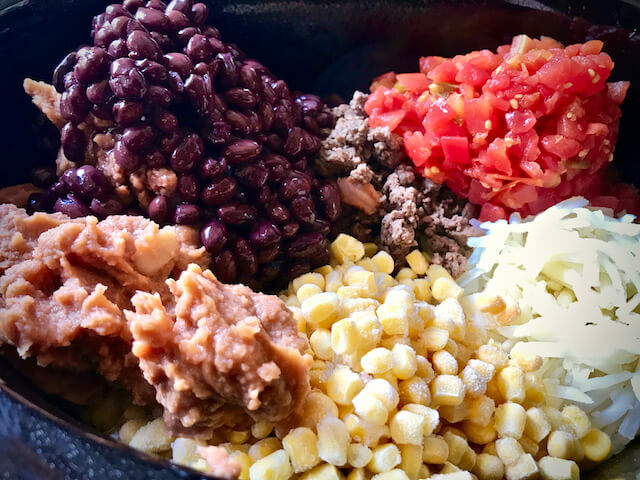 Do you drain the black beans? I drain them ,but don’t rinse’m! Just made this and it’s sooo good. Star you are brilliant!! Mine turned out more like soup but I’m not mad about it. The flavors are incredible! This sounds incredible, thank you! I always get so excited when I see your email in my box . Thank you for all you do for us! I thought I left a reply. Perhaps not. Do you have any idea how many points for WW? In the notes section of each printable recipe I always provide the ww info & calorie info. This chili is 3 points! I hope you enjoy! Use the calculator on the WW app. I assume if you use 99% fat free turkey, you could eliminate all the ground beef points. For sure! I’m not a huge fan of 99% fat free ground turkey, but do use 93/7 a lot. I don’t have the info handy for the points, but I’m guessing it would probably be 1 or 2 points using it. I’m so happy you loved it, Marlene! Thanks for stopping by to give it a 5 star rating!! What a compliment. The turkey would work just fine in place of the ground beef and the points would come down a bit. Do you know how many points for WW? 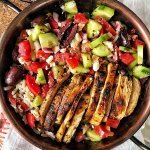 Thoughts on making it vegetarian? Thinking omit beef and double up on black beans, with veggie broth – should still be yummy, right?!? I think it should be perfect that way. I hope you love it, let me know how it goes! Made this yesterday, vegetarian style, and it was delicious! The house smelled so good all day, definitely recommend. Even my meat-eating hubby loved it done vegetarian. 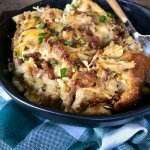 Very hearty, was the perfect comfort food for a snowy day here in the Midwest! How long on the stove? I haven’t actually made it on the stove yet because it’s a slow cooker recipe, but i’d say probably heat everything up together for 25 minutes maybe let the flavors mingle together for a bit. With chili, I’ve always been in the “the longer the better” camp. I ended up doing it in my Instant Pot. Sautéed meat in high until browned. Added everything to the pot then cooked on chili setting on high for 30 mins. Worked great! Is this recipe missing some more beans or only the black beans?